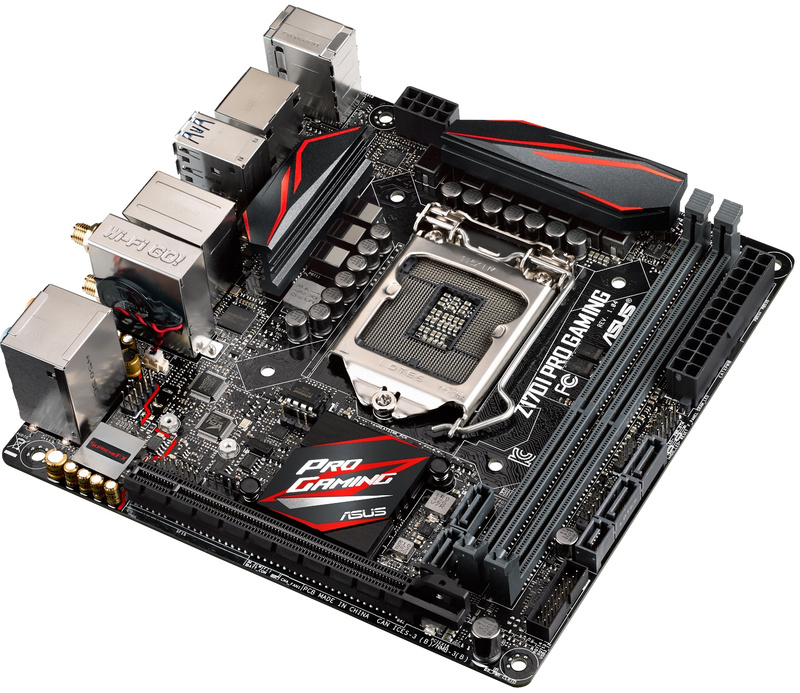 Asustek Computer this week introduced its Z170I Pro Gaming mainboard, which is desinged for Intel Corp.’s latest microprocessors code-named “Skylake” and provides ultimate feature-set. The platform not only uses high-quality/high-performance components and has rich expansion capabilities, but even features advanced overclocking functionality. The Asus Z170I Pro Gaming is based on the Intel Z170 core-logic set and supports all modern LGA1151 microprocessors, including the top-of-the-range Intel Core i7-6700K. It features four-phase digital voltage regulator module consisting of high-quality solid-state inductors and capacitors. The manufacturer claims that the mainboard fully supports advanced overclocking capabilities, including overclocking of CPU base-clock, voltage increases and so on. The motherboard can even run DDR4 memory at frequencies of 4000MHz (4GHz), thus providing processors up to 64GB/s of bandwidth. 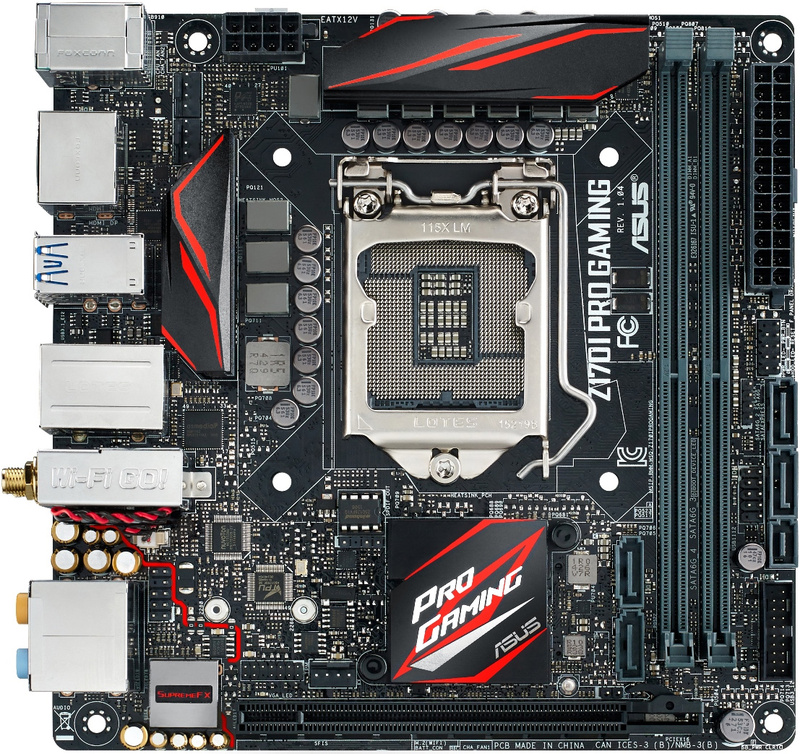 Asustek’s Z170I Pro Gaming mainboard comes with two DDR4 memory slots, one PCI Express 3.0 x16 slot for graphics cards, one high-performance M.2 connector (with PCI Express 3.0 x4 interface) for advanced solid-state drives in 2242/2260/2280 form-factors, one SATA Express connector, two Serial ATA-6Gb/s ports, 7.1-channel Supreme FX audio with headphone amplifier and 115db sound-to-noise ratio stereo output, two USB 3.1 type-A ports, six USB 3.0 ports, and so on. Networking capabilities of the Asus Z170I Pro Gaming are top-notch. 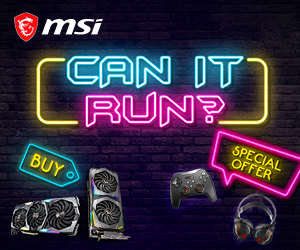 The motherboard features Intel’s Gigabit Ethernet (I219-V) controller with Asus LANGuard and GameFirst technology, which prioritizes gaming traffic and minimizes latencies. The mainboard also comes with dual-band 2.4/5GHz 802.11a/b/g/n/ac Wi-Fi module with MU-MIMO support as well as Bluetooth v4.1 technology. Maximum transfer-rate supported by the Wi-Fi module is up to 867Mb/s. 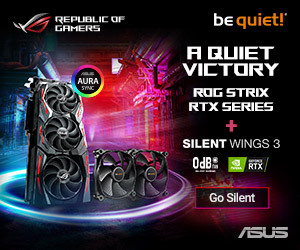 The combination of rich feature-set, high-quality components and overclocking functionality clearly position the Asus Z170I Pro Gaming as a high-end platform for mini-PCs. 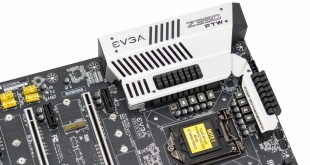 Exact pricing of Asustek’s Z170I Pro Gaming is unknown, but typically such mainboards are not affordable.